The 2015 scheduled establishment of ASEAN Economic Community (AEC) together with the implementation of World Trade Organization (WTO) commitments and other bilateral and multilateral free trade agreements will completely help Vietnam’s retail market to go out the restriction, putting local businesses in a face to face competition to foreign giants. After eight years of a WTO member, Vietnam has attracted most of the world and region’s leading retailers such as Metro Cash & Carry (Germany), Big C (France), Parkson (Malaysia), Circle (the US), Lotte (South Korea), Aoen (Japan) and FairPrice (Singapore). Two Thai giants Berli Jucker and Central Group have recently implemented their projects in Vietnam. Singaporean Shop & Go has been in Vietnam since mid 2005 and become the largest convenient store chain with 110 stores, followed by the US’s Circle K with over 70 outlets in Ho Chi Minh City. B’Mart of Thailand has launched 96 outlets in Vietnam after buying the Japanese FamilyMart chain, the number is expected to hit 300 by 2018. Big C has recently opened more than 10 C-Express stores nationwide. Inadequate statistics show that HCMC has about 700 convenient stores–66 of these are operating in chains, and 37 commercial centers, 168 supermarkets, about 723 convenient stores and 240 traditional markets. According to a survey, the 10 million population city should have 100 commercial centers, 1,000 supermarkets, 10,000 convenient stores to diversify the distribution system and better serving the shopping demand of residents. Vietnam is a potential retail market. Retail revenue growth averaged 21.2 percent for the last five years and earned US$124 billion in 2013. While the number of domestic retailers is rather limited, namely Saigon Co.op with 72 supermarkets, 86 Co.op Food stores, 200 Co.op stores, one Co.opXtraPlus and one commercial center Sence City. Besides, Dong Hung Company has 26 Citimart supermarkets, An Phong Company has six Maximark trade centers and Saigon Trading Group has two supermarkets and 42 Satra Food stores. Nhat Nam Company is with Fivimart supermarket chain and Hanoi Trade Corporation with some supermarkets and Hapro stores. 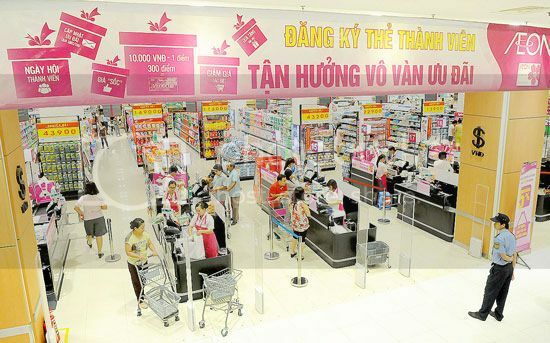 Chairwoman of the Vietnam Retailers Association Dinh Thi My Loan said that about 10 percent foreign retailers have been present in Vietnam, running 40 percent of the country’s supermarkets. They are forecast to continue increasing in the country. According to WTO commitments, foreign direct investment (FDI) companies have been permitted to join Vietnam’s distribution system since 2009 in 110 out of 155 service sub-sectors as per WTO’s classification, including commission agent, wholesaling, retailing, multi level marketing, and franchising. They have not been permitted to distribute cigarette, newspaper and book, magazine, videos, precious stones and metal, medicine, dynamite, petrol, crude oil, sugar and rice in Vietnam. On March 29, the Government has loosened the Economic Needs Test (ENT) which foreign firms have to pass to establish their second and subsequent outlets, providing them with an ENT exemption for retail stores of less than 500 square meters to sell some items in the banned list such as rice, sugar, cigarette and book and newspaper. Vietnam has also pledged not to limit the origin of products in foreign retail outlets in the country, giving foreign retailers full power to decide what kinds of goods with Vietnamese or foreign origins that they can sell in Vietnam.